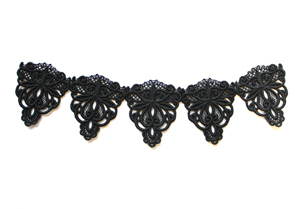 There's just something dark and enchanting about lace, making it the perfect accent you've been looking to add to special outfits or costumes. 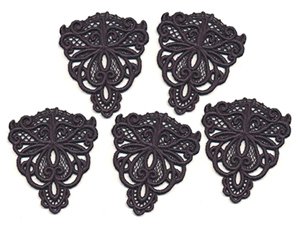 We'll show you how to transform the freestanding lace embroidery designs in the collection of Dark Adornments into six gorgeous lace accents, so you can use them for all your projects that need that romantic lace touch. 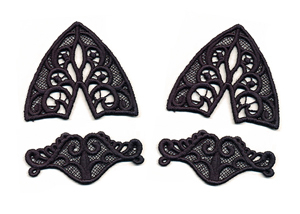 Each of these accents requires the lace pieces to be already stitched out, we will show you how each is assembled. 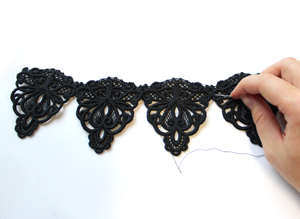 Before we begin, see this tutorial for basics on stitching out freestanding lace! 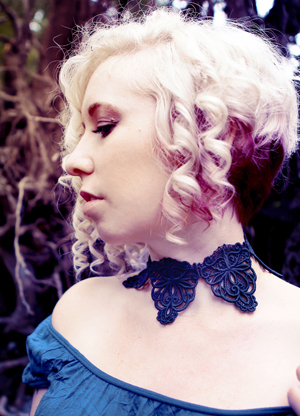 The ChokerThe first thing I'll show you how to make is the multi-piece choker. 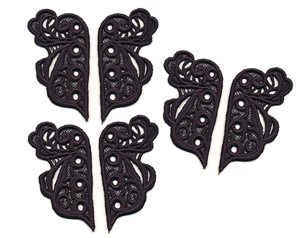 Grab your embroidery design file here, and stitch out four to five lace pieces using the design, depending on how long you want the necklace to be. 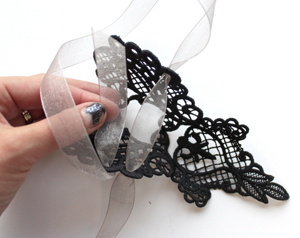 To assemble this choker, you'll need your pieces of lace, a hand-sewing needle and matching thread, and some ribbon. Hot glue also helps. 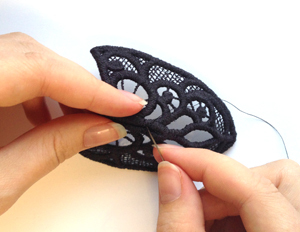 To start, place two of the lace pieces together, touching like so, right sides down. Stitch them together where they touch, trying to keep as many of your stitches on the back side of the lace as you can. I prefer to stitch through the thick satins for an extra secure hold. 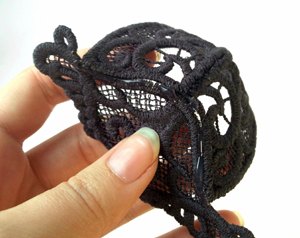 Continue adding lace pieces in exactly the same way. 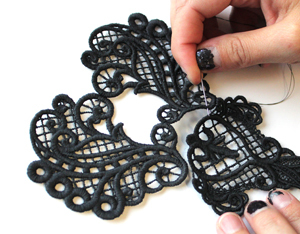 Make sure the right side of the lace is always down, or one of the pieces will have the wrong side showing! Continue until you have all your pieces stitched together. These pieces plus a ribbon should fit most people. For kids or smaller adults, you may only need four pieces. Finally, cut two long pieces of ribbon and stitch them to the back edges of each side of your necklace. Once I stitched mine in place, I also added a dab of hot glue over each ribbon end for extra strength. Just tie your choker on in a loose bow, and you're ready to go! Even better, you can adorn your necklace with chains and beads like we did with this Battenberg Lace Necklace, for a truly elegant piece of gothic splendor. The next piece we'll construct is the rose. From the 6 pieces, it might look complicated, but it's actually pretty easy. 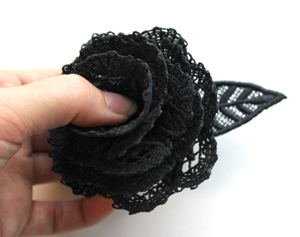 To make your rose, you'll need your flower design lace pieces all stitched out, a needle, matching thread, and hot glue. 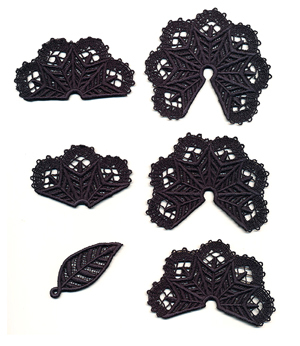 Grab the largest lace piece (pictured top right in the previous image) and pull it closed together so the two edges are touching. Stitch it shut in a cone shape, like so. 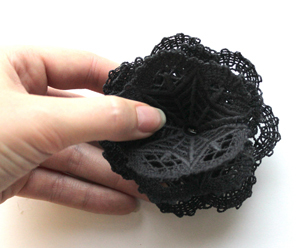 Repeat this with each of the petal pieces of lace (not the leaf), wrapping each smaller and smaller as you stitch them. When you're done you should have 5 petal pieces stitched into small "cone" shapes of varying sizes. To encourage the petals of each layer to "curl" like a flower, I scrunched each one in my hand to press back the Battenberg edges. 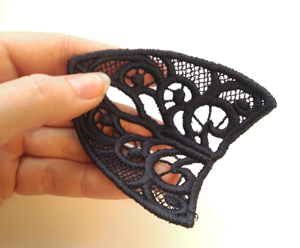 Normally we like lace nice and flat, but in this case a little curl makes it look more like a rose! Now we just need to glue the layers together. Start with your largest most open piece. Add a ring of hot glue around the bottom opening. Press the next size layer on top. Try to make the petals offset, instead of lining up with each other. This will further the look of the real flower. Once this layer is in place, add glue to the middle of that one, then add the next size layer of petals. Continue adding your layers until you finally add the last, smallest piece in the middle. Now you have a rose! As a final touch, turn your rose over and add some glue to the bottom. Glue your leaf in place. You'll notice the rose and leaf both have round openings you can use if you want to build in a wire "stem," but in our case we just made it on its own. 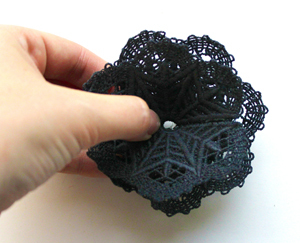 When the glue is dry you have a beautiful, dimensional lace rose! 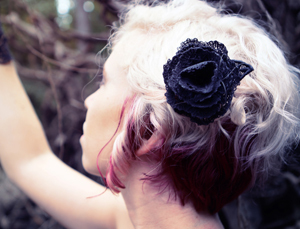 Perfect for costume accents, bouquets, hair pieces, and anything else you can think of! 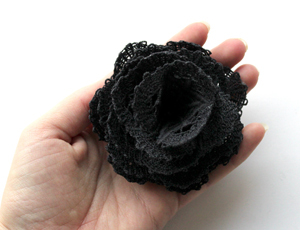 Stitch a whole bunch for a crown of roses, use them as gifts or lovely accents. Use your imagination! 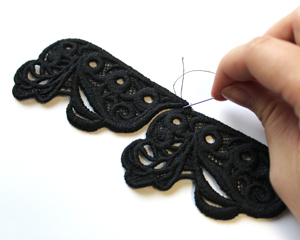 For these elegant lace gauntlets, you'll need to stitch out three pieces of lace per glove. 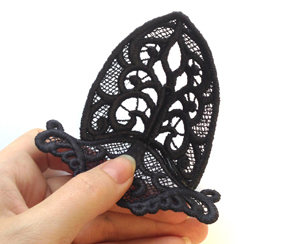 You'll also want a needle and matching thread, a ribbon for each to lace them up, and a small piece of elastic or thread to hook the top leaf onto your finger. Start with the two matching mirrored pieces. You want to connect them by the two swirl sections. Stitch them together. When your finished stitching the two pieces (as pictured) you'll want to stitch in the third hand piece. 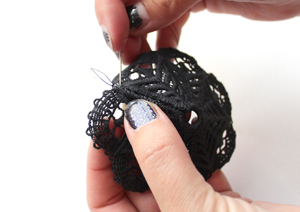 Place it evenly between the bottom of the two pieces and stitch them together in all of the places the lace touches. When the pieces are secured in place, take a long piece of ribbon (I used about a yard per each glove) and loosely lace it through the loops on either side. It helps if the ribbon is cut at an angle to feed it through the holes. 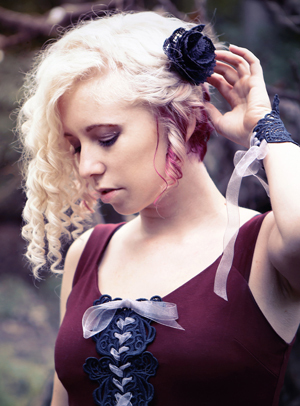 This will wrap and secure around your wrist in a corset-style fashion. When it's laced, try it on. Then cut a small loop of elastic of thread and size it to your middle finger. Stitch in a loop to the top of the leaf at the top. 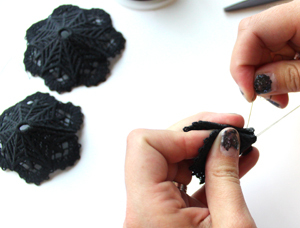 Now that your first piece is assembled, repeat the process to create your second glove! With both your gloves ready, slide them on, slipping your middle finger into the top loop of each glove, then lace them up with the ribbon lacing. 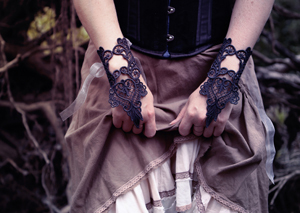 These gorgeous lace gauntlets are prefect for that unexpected accent to your chic outfit, or even stitched in white for a wedding! This piece is as simple as it gets. 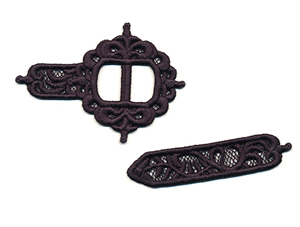 You'll need your two lace pieces - the buckle and the strap. Basically, these two pieces slide into each other to create the illusion of a "buckle" (note that it won't actually hold anything closed -- it's just for show). Then you just secure it on whatever needs a fun accent! Needle and thread are great for this, and you can choose to stitch your buckle totally "shut," or just stitch the ends in place and let the buckle open and close as you please. 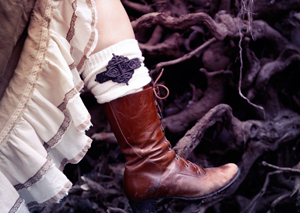 They make great accents on boot toppers, down the front of jackets, on a top hat, or anywhere a fancy buckle is required! This piece is easily assembled, but the number of pieces you'll want to stitch out depends on your desired length. Grab the design here. You will need a needle and thread, as well as a sewing machine if you wish to secure them in place on your final costume piece. All of the left pieces will get stitched together in a line, top to bottom, and the same for the right pieces. Continue adding more to get the length you want. 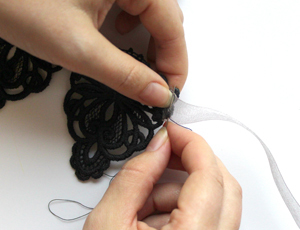 To begin, pick one side of your lace, and place right side down, then slot them together like so. Stitch the pieces where they touch. They should form a straight edge along the side when finished. Here's what two pieces look like stitched in place. 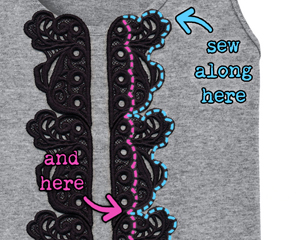 Continue adding more to get the desired length of your "lacing." 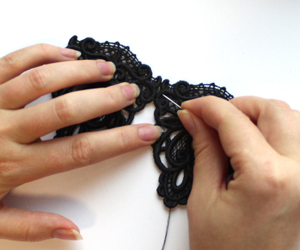 Repeat this process on the other half of the lace, so you have two sides to lace together. Once you have your pieces stitched to their desired length, place them on your garment of choice (down the front of a dress or tank, for instance) about half an inch or so apart. First, stitch the lacing piece in place by sewing along the outer edge, shown here in blue. Then, secure it right along the edge where it will lace up, for extra strength, shown in pink. Repeat for both lines of lace. 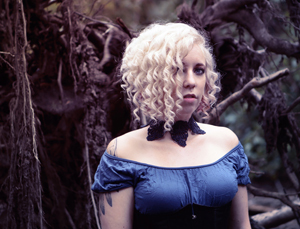 With your lacing in place, you can then cut a long piece of ribbon and "lace" up your new bodice. 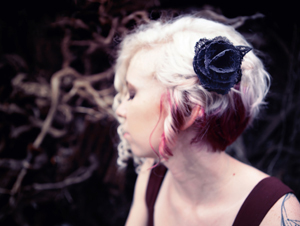 This left you add a corseted look to any piece you wish! Note that this element is decorative -- while you really can lace it up with ribbon, it won't be strong enough to cinch a tight corset. But it's just right for creating that romantic look on all sorts of garments! Try it on costumes or plain outfits. It looks great laced down the front as a bold accent, down the back for a traditional look, or in unexpected areas, like shoulders. Anywhere you want the romantic look of lacing! 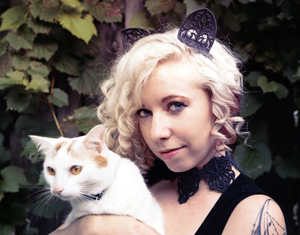 Finally, the costume season wouldn't be complete without a simple but classic set of kitty ears! 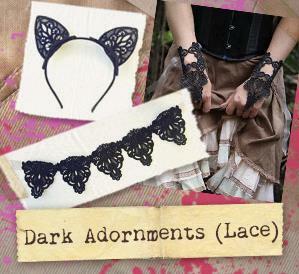 To make a complete set of kitty ears, you'll want to stitch each set of lace twice, so you end up with these four pieces. To assemble them you'll need a needle, matching thread, hot glue, and a plain headband. First, assemble each ear. Start with the main ear piece. You'll notice there's a little triangle "gap" in the middle of the ear. Pinch this together and then stitch it closed from the back side. Stitching this closed is what gives our kitty ear a nice curve so it looks more dimensional. Next, stitch the middle line of the ear in place with the middle of its base using just a few stitches to keep it centered. Then, use hot glue to secure the rest of the ear along the curved edge, like so. When it's done, you have a simple little cat ear with a base and some wonderful dimensionality! If you like you can skip the headband and just use a hair clip instead with each ear. 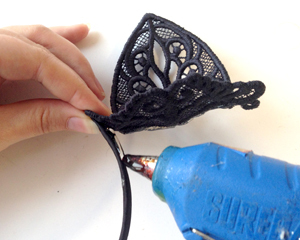 If you want to put it all together on a headband, grab your hot glue. 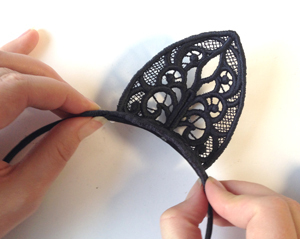 Measure out the spacing on your kitty ears first, then run a line of hot glue down the headband. 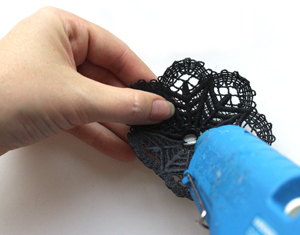 Press and hold the lace in place until it's dry. 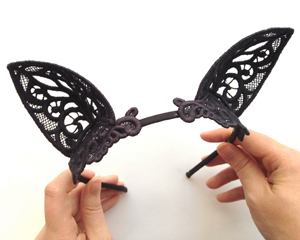 Repeat those steps on the other side for a complete set of kitty ears! 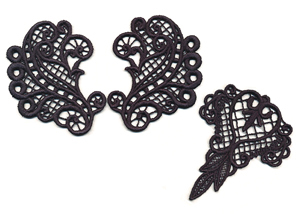 They're a fun and whimsical way to complete your lace set, especially for a simple and elegant costume. You'll be the prettiest kitty at the party. Well, at least the prettiest kitty that actually wants her photo taken. 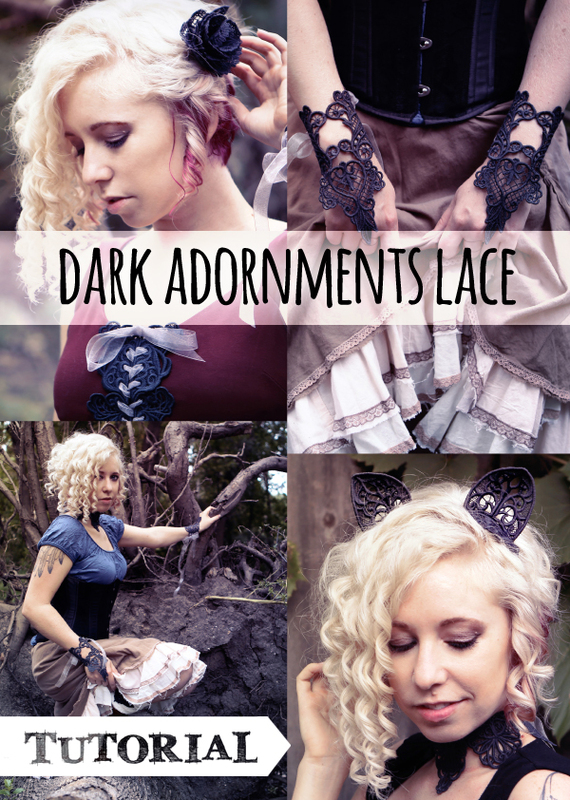 Enjoy crafting your own lace elegance with one or all of these Dark Adorments. They combine in endless ways as accents on garments, costume accessories, or elegant embellishments to big events! You're sure to make a big statement this season with your own handcrafted pieces.